“A Day in the Garden” is more than just a BIG volunteer work day. It’s more than just an opportunity to hear about our gardening and composting projects. You’ll spend the day with us, touring and learning about healing herbs, native plants, pollinators, and why rotting food is good for your garden. You can sit in on one of our workshops — where topics can vary from essential kitchen medicinals, to when a weed is not a weed, to how to compost under the kitchen table in your apartment. 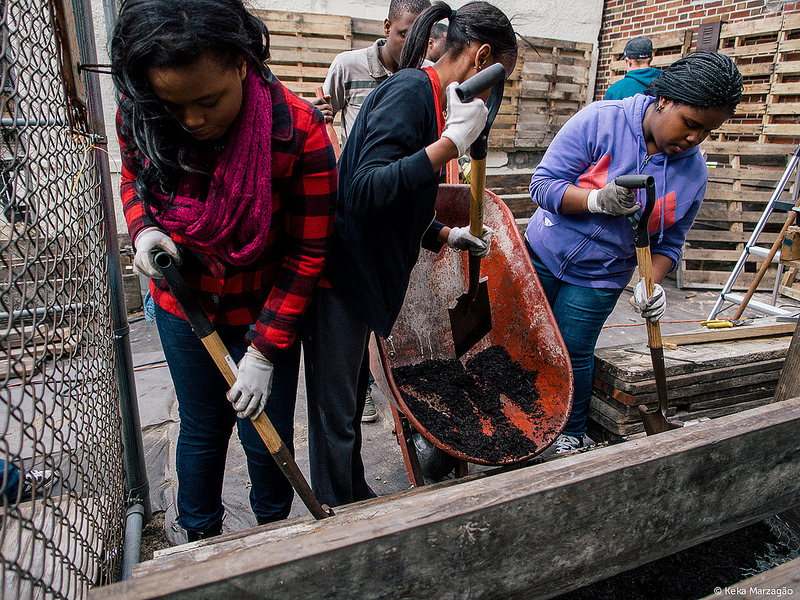 You’ll be learning from Flatbush neighbors who also happen to be experts in gardening, composting, herbalism, and more. Check our calendar for each month’s special programming! Our Open House is family-friendly, with fun activities for kids to participate in and healthy yummy snacks to savor. Each month when you visit, there will always be something new to see as our garden and compost projects develop. And for those of you who just want to get your hands dirty, join our team of volunteers during garden and compost open hours happening at the same time. We have lots of tools — just wear comfortable clothes and closed-toe shoes.